Australian composer Kate Neal’s Never Tilt Your Chair (2017), for which she also designed the instruments, was one of the two works that comprised Never Tilt Your Chair Back On Two Legs, presented by Tura New Music and PICA. It plays on the sense of ritual that surrounds the sanctified family dinner table. The performance space has an air of familiarity with three chairs on three sides of a centrestage table and the fourth side, without a chair, open to the audience, an invitation to be involved in this mealtime. The performance is a humorous take on the rules that we face at the dinner table, hence the work’s title. The performers lick and kiss knives, put their elbows on the table, throw napkins to the floor, sniff, rub their noses and chew with mouths open. The work utilises ‘extended’ techniques for cutlery, like striking forks and letting them ring—producing tones similar to tuning forks—and then pressing the prongs into the table to bend the pitch and using the mouth to amplify the tone. 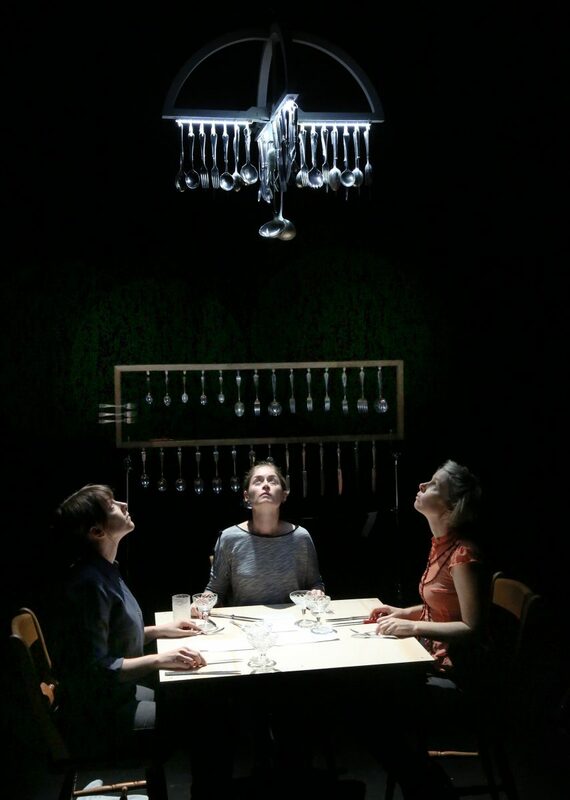 The highlight of the staging for this piece is the shimmering cutlery chandelier hanging above the table, with spoons, forks, knives and a ladle at its centre. Towards the end of the first movement the chandelier vibrates, becoming an instrument in its own right and producing a captivatingly eerie and omnipresent dissonant hum. 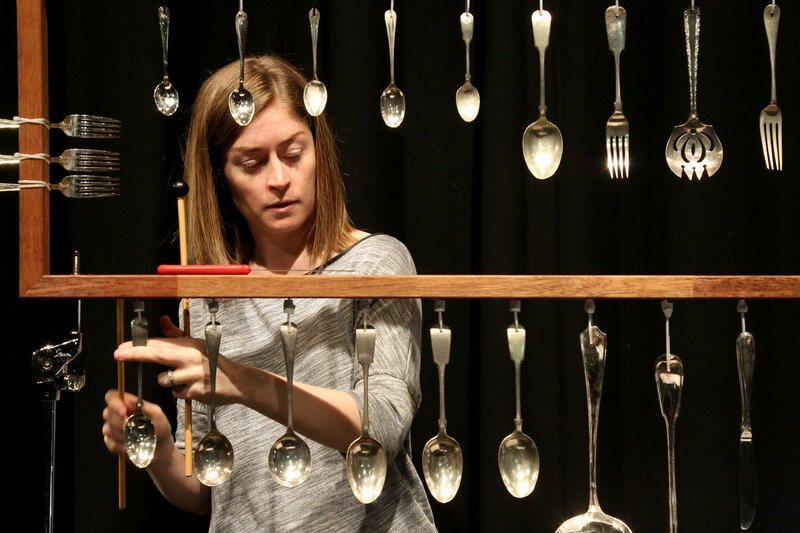 The second movement sees Louise Devenish, Leah Scholes and Vanessa Tomlinson each move to wooden frames from which dangle slightly different combinations of utensils arranged in ascending pitch order. 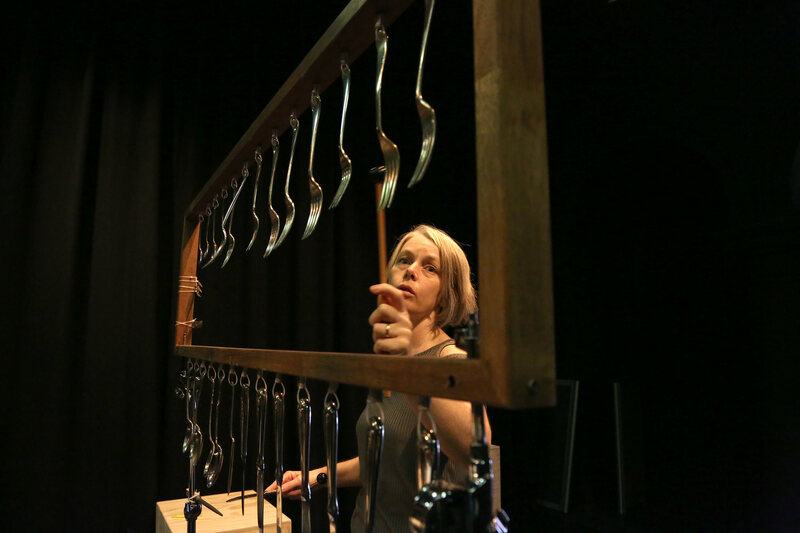 The performers play these homemade creations as if they are metallophones, initially striking with hard mallets and then moving to a mix of skewers and knives. The sound of cutlery on cutlery evokes a homely feeling reminiscent of those times at the table when everyone is too busy eating to talk, and closes the piece in a very rounded way. The concert’s programming is masterful in its combination of the bright metallic sound world of Never Tilt Your Chair Back, with its 100 pieces of tuned, often antique cutlery, and the warmth of the wooden instruments and objects deployed in the next work, Dressur (1977). These polar opposite sound worlds successfully complement and contrast with each other, the theatrical nature of the works being their point of connection. Dressur, a 30-minute work composed in 1977 by Mauricio Kagel, combines visual and auditory elements in a theatrical space. The title comes from the German word for dressage, described by the International Equestrian Federation as “the highest expression of horse training where horse and rider are expected to perform from memory a series of predetermined movements” [program note]. To this end, Dressur features a series of quite complex musical and stage directions to be performed from memory, putting the performers in situations in which the seriousness of the task is juxtaposed with comic outcomes. The audience can’t help but laugh. Dressur features a multitude of instruments and non-instruments laid out at three stations. Devenish begins at the marimba (the primary melodic instrument in the work) playing quick arpeggiac patterns akin to circus music, to which Scholes and Tomlinson in turn interject with a threatening chair and castanets. Though featuring a single instrument at a time, the work’s combination of sounds and performative elements creates an onslaught of aural and visual information that is incredibly entertaining. Dressur is instrumental comedy of sorts; the instruments are played incorrectly drawing entertaining connections—for example, castanets used to imitate a typewriter. Devenish begins the work with quick arpeggiac patterns on the marimba (the primary melodic instrument in the work) which are reminiscent of circus music, to which Scholes and Tomlinson in turn interject with a chair and castanets. Highlights include Devenish dramatically up-ending a bag of wood chips onto the floor and Tomlinson unzipping the front of her dress in order to play coconuts positioned on her stomach and chest. Devenish interrupts her colleagues’ playing, dramatically tossing a string of wooden chimes about and, finally, slinging them over her shoulder. Auditorily, Dressur appears to focus on a single percussionist or instrument at a time, but after factoring in the performative elements of the work, the piece is experienced as an incredibly entertaining onslaught of aural and visual information. Demonstrating their prowess—with dramaturgical assistance from Rèmi Deulceux for Never Tilt Your Chair—the trio delivered immersive performances of engaging, dramatic works executed with impeccable comedic timing, making for a memorable concert experience. With any luck this program will be performed again.